Luigi Maria D'Albertis (November 21, 1841 – September 2, 1901) was born in Genoa and was a flamboyant Italian naturalist and explorer. In 1872 he makes a trip from Andai to Mt. Hattam (Arfak). 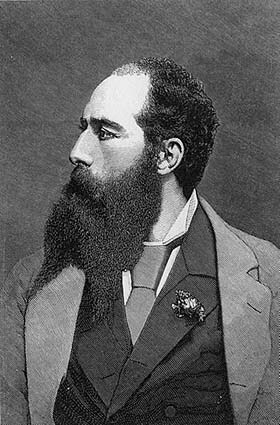 In 1876 he became the first person to chart the Fly River in Papua New Guinea. He took eight weeks to steam some 580 miles (more than 1000 kilometers!) 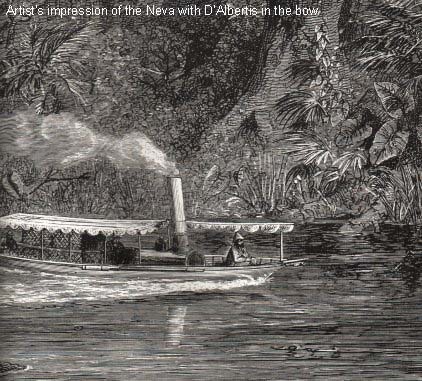 up the Fly River in an Australian 9 ton launch steamboat, the Neva, provided by the New South Wales Government, which the natives called "the turtle". The Neva forced its way upstream until brought to a halt by shallow water. They then steamed downriver to a tributary called the Alice (named after the wife of the New South Wales Premier). The Victor Emmanuel Mountains were named by him in honour of the King of Italy. D'Albertis cajoled his crew up the river Alice with promises of gold. He kept a pet python on board to prevent his motley crew from pilfering the stores. D'Albertis behavior was rather aggressive and violent against native people and his own crew. He rather shoot on sight instead of negotiation. This resulted in D'Albertis being hated by his crew and Lawrence Hargrave, a young engineer, later to become an aviation pioneer, wrote about this cruel behavior in his diary. But the people of the Fly River region were hostile, and in one fierce encounter the Neva was struck by 45 arrows. He fired off exploding rockets to keep hostile natives at distance. Apart from shotguns, explosives, fireworks and bluffing to the local people with fire and death, "the white man out the turtle" had one very peculiar weapon which gave him prestige with the local people: opera music! With his phonograph, records and his own singing voice he startled the Papua people which calmed them down. Eventually stricken by malaria and crippled by rheumatis in both legs, he admitted defeat. He tried once again in the following year, but did not reach as far as before, and returned to Europe, taking with him the head of a local warrior in alcohol as a trophee. The story goes that he himself cut off the head of the warrior, showing the locals that also the white men have the power to cut off heads of people, as a warning of his strength and courage. His expedition collected specimens of birds, plants and insects. His cousin, fellow explorer Enrico Alberto d'Albertis, housed many of Luigi's specimens at Castello D'Albertis. The castle is now home to the Museum of World Cultures. His natural history specimens from New Guinea are in the Natural History Museum of Giacomo Doria in Genoa. Many species are named after D'Albertis (as albertisi). source: the major part of this biography is from Wikipedia.